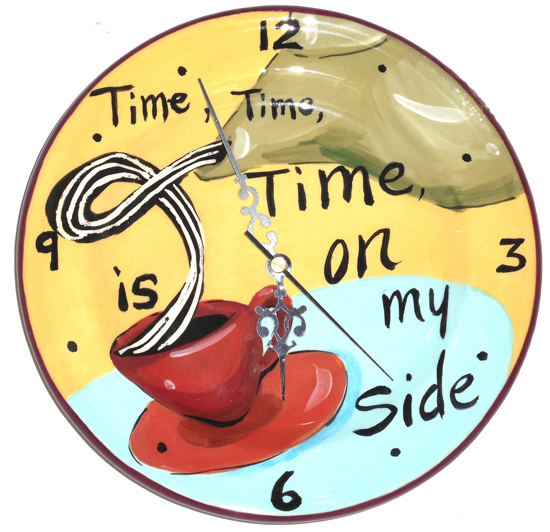 This 8 1/2" wide clock hangs on the wall and the saying reads "Time, time, time is on my side". 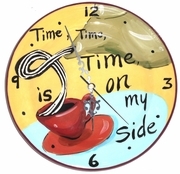 Anyone of our patterns can be put on this clock face for you. Just call (508)932-2574 or e-mail (drolldesigns2@yahoo.com) for assistance. Runs on a single AA battery(not included). Design of clock hands may vary. Allow 4-6 weeks delivery. Click on photo to enlarge for details.